Genesis Chapter 3 is the third of eleven in a series of studies of the first 11 chapters of the first book of the Bible. Learn about the fall of man and how Adam and Eve's sins affect us all still today. See how Satan, the Father of Lies, uses a lie to trick mankind just as he continues to do today. Your learning comes from reading and studying the Bible. After you have read the Scripture passage below, it's a good idea to answer the daily study questions. 1. Who is the serpent and what are the possible explanations for a talking snake? 2. Compare and provide comment on the extracts of scripture from Genesis Chapter 3 below. What was the lie, the temptation, and the trickery of each? "You are free to eat from any tree in the garden; but you must not eat from the tree of the knowledge of good and evil, for when you eat of it you will surely die." "Did God really say, 'You must not eat from any tree in the garden'?" “We may eat fruit from the trees in the garden, but God did say, 'You must not eat fruit from the tree that is in the middle of the garden, and you must not touch it, or you will die.'" "You will not surely die," the serpent said to the woman. "For God knows that when you eat of it your eyes will be opened, and you will be like God, knowing good and evil." . 3. Describe the transformation of Adam and Eve that occurred when they ate of the tree of knowledge of good and evil. What was different about them after they ate of the tree? 4. In verse 8 of Genesis Chapter 3, God is said to be walking in the garden. This is an example of personification where human traits are attributed to God. We know that God is Spirit (John 4:24). 5. Analyze Adam’s answer to God’s questions "Who told you that you were naked? Have you eaten from the tree that I commanded you not to eat from?" 6. If you could sum up the fall of man in one word, what would the word be? 7. What does enmity mean? Describe what this first prophecy found in the Bible, spoken by God Himself, is predicting. 8. Who are the woman’s offspring or seed? Who are the serpent’s offspring?. 9. 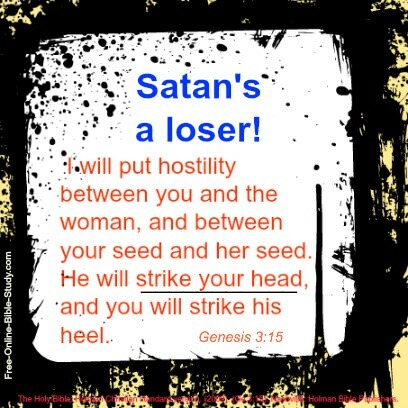 List the consequences for all women for Eve’s sin from verse 16 of Genesis Chapter 3. 10. List the consequences resulting from Adam’s sin from verses 17 through 24 of Genesis Chapter 3. Which is the most serious? 11. Regarding the tree of knowledge of good and evil God promised Adam in Genesis Chapter 2, verse 17 “but you must not eat from the tree of the knowledge of good and evil, for when you eat of it you will surely die. ", Satan said he would not surely die. Did Adam die? If he did die, how did he die and how are we affected today? 12. 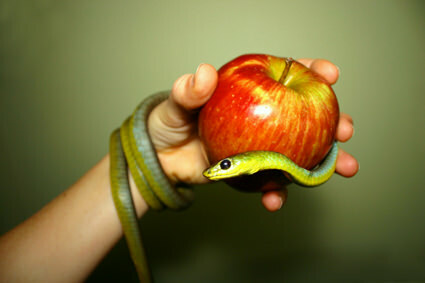 Did Adam and Eve realize they were committing a sin by eating from the tree of knowledge of good and evil? Why was it wrong if they did not yet understand the difference between good and evil? 13. Was the Garden of Eden a physical place or a spiritual place or a relationship? Click here to compare your answers.